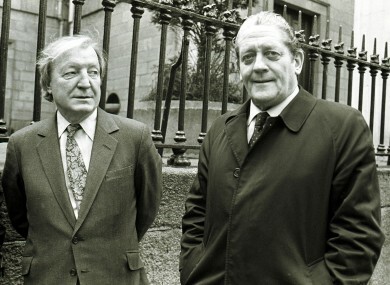 Haughey and Lenihan pictured in 1986. NEW DETAILS OF calls placed by senior Fianna Fáil figures to President Patrick Hillery in 1982 on the night that the Fine Gael-led government was dissolved in the wake of a controversial budget have emerged. In logbooks from the papers of Hillery, which are housed in the archives of the University College Dublin and published by the website historyhub.ie, there are new details of calls made to Áras an Uachtaráin on the night of 27 January 1982. The night is widely viewed as one of the most infamous in Irish political history as then Taoiseach Garret FitzGerald sought to dissolve the Dáil in the wake of a controversial budget which proposed introducing VAT on children’s shoes and did not have requisite support from independent TDs. Hillery refused to speak to then Fianna Fáil leader Charles Haughey, Brian Lenihan Sr and other senior party figures who sought to persuade him to refuse the dissolution of the Dáil and instead allow Haughey to form a government without the need for a general election. The events of that night would have far-reaching consequences when Lenihan Sr ran for president in 1990 and insisted that he had “no hand, act or part” in efforts to pressurise Hillery in a famous appearance on Questions & Answers. Despite evidence to the contrary he always denied involvement in the affair, famously stating that “on mature recollection” he had not phoned President Hillery. The logbooks, discussed on RTÉ Radio’s The History Show last night, detail how Haughey called the Áras five minutes before a call was placed from the Department of Taoiseach asking the president to receive FitzGerald who would ask for the 22nd Dáil to be dissolved. I am the leader of the largest party in the Dáil. I am available to form a government. I do not wish the Dáil to be dissolve (sic). Ask the President or Secretary to ring me. The logbook states that the president was informed as the ‘action taken’. Five minutes later at 8.20pm, a call came from the Taoiseach’s department asking that the Taoiseach be allowed call to the Áras at 10pm. The president was informed and permission was granted. Then at 8.30pm a call came from the private secretary to Haughey, Catherine Butler, with the logbook stating that she wished to speak to the president or his private secretary. The ‘action taken’ column states that the president and his secretary were not available. Then came a call from Seán Dublin Bay Loftus, an independent TD, who voted against the budget of then Finance Minister John Bruton, and who implored the president to call a meeting of the Council of State as well as both houses of the Oireachtas “to form a national government”. Then between 8.45pm and 9.30pm there were at least two calls from Lenihan, possibly a third, and Clare TD for Fianna Fáil Sylvester Barrett both of whom said they wished to see the president “on a private matter”. They were told that the president was not available. Calls also came from from what appear to be members of the public who urged the president to form a national government rather than hold new elections, the second in eight months. I am leader of the largest party in the Dáil. I wish to speak to the President on a Constitutional matter and it is urgent. I propose to call to Áras at 22.30 hrs to see the President. Please inform the President. I will wait for his answer. Eventually the President is quoted in the logbook as saying: “It is not appropriate for me to speak to you at the moment”, a quote which Haughey was informed of. The logbook notes that Captain Barbour told Haughey that the President “will be informed a.s.p”. At 10.03pm the logbook notes that Taoiseach Garret FitzGerald arrived at the Áras to request the dissolution of the Dáil, a request whcih was granted, before he left at 10.40pm. In the subsequent election, held on 18 February, Charles Haughey’s party won 81 seats and formed a minority government with the support of independents including Tony Gregory. But that government would fall in November, leading to another election. For Hillery, he later put on record that everything Captain Barbour recorded that night was at his request. The events of that night would trouble Lenihan throughout his 1990 campaign for president, a campaign which he lost to Mary Robinson, making Lenihan the first and only Fianna Fáil candidate to lose a presidential election. Email “New documents detail Fianna Fáil pressure on President Hillery in 1982”. Feedback on “New documents detail Fianna Fáil pressure on President Hillery in 1982”.